A concept note is a short version of a proposal. Donors often request concept notes as the first step in funding applications. This allows them to screen applications so that only the best ones are invited to submit a full proposal. Usually the donor has their own concept note template that you can use. If they don’t have one then this template is a useful starting point. The donor doesn’t have a specific concept note template. The concept note is for a small to medium size program. The donor has a specific concept note template that you should use. The concept note is for a large or complex program. 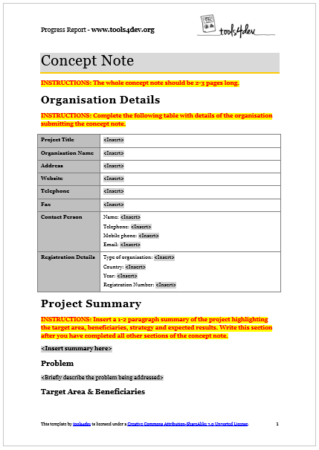 The Concept Note Template by tools4dev is licensed under a Creative Commons Attribution-ShareAlike 3.0 Unported License. All other content is © tools4dev.